Yes you read that right....Watercolor Neon. I didn't know if it would work. I had had this idea in my head since I saw the stamp. I just had to try it. I am pretty happy with the results. 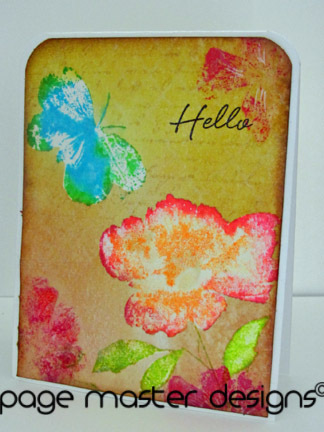 I misted the neon inks with Perfect Pearls before I stamped them and I loved the effect. I love the bold neon against the muted background. The flowers in the corner are another from the set with the butterfly. I added a little bit of white gel pen to give them some dimension. Oh, nice! I have this on my play list already. Thanks for showing us it's possible! ooohh, I officially *need* ALL the daubers, haha! gorgeous card!